The Dainty Ladies Book Group is a very small, exclusive club with only three members. It was started by my granddaughter Nina who suggested that we would all read the same book and then discuss it. The first invited member was Aunt Judy, and then I asked to join too and was accepted. We take turns choosing the book. So we started with HOLES, a book Nina chose, and when we had all finished it, Nina and I on the phone at my house called Aunt Judy and we talked about the book. Nina had written questions to discuss. We really wanted to do FaceTime but I couldn’t get it to work, so we had to discuss by phone. 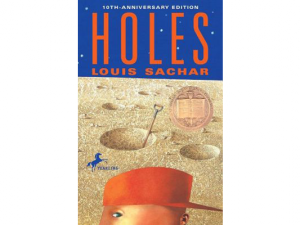 HOLES was written by Louis Sacher and won the Newbery Award in 1999. It was made into a movie by Walt Disney. The next book we will all read is my suggestion, HITTY: HER FIRST HUNDRED YEARS, by Rachel Field. It won the Newbery Award in 1930. We all have the book and when we all finish reading it (Judy and I have already read it several times) we will discuss it again. Then it will be Judy’s turn to pick a book. Nina chose the name for our club. This entry was posted in Book Groups, Family, Uncategorized and tagged Book groups, Books, Hitty, Holes, Newbery Prize, Reading. Bookmark the permalink. Nina decided that Hitty was too complex–it follows a wooden doll from her creation in the State of Maine to a whaling ship in the Pacific that kills a lot of whales, then catches fire, so that they abandon ship but wash up on a deserted island, which is soon visited by “savages” who take Hitty for an idol to be worshiped. Sneaking away at night, they are rescued by a freighter who takes them to India where Hitty is picked up by a snake charmer, who sells her to a missionary’s daughter, who takes her back to the U.S. That’s just the first half of the book. Nina felt there was too much background that she doesn’t have yet so we are not going to read that book just now!